Flower Craft Gift Idea & Easy Tutorial For Kids- So Festive! - So Festive! 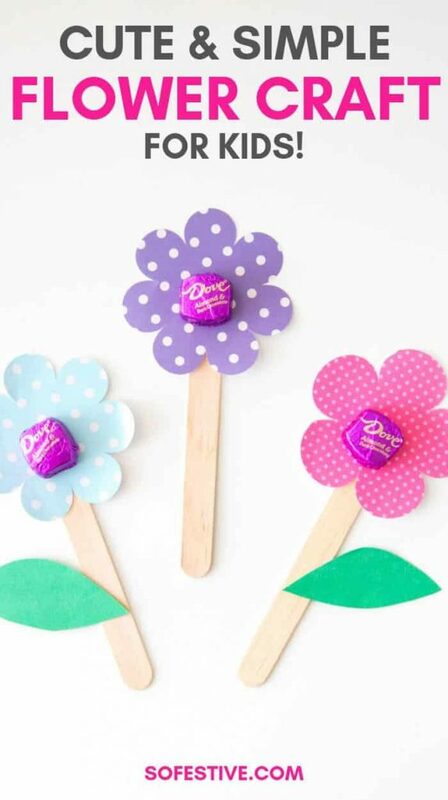 Need a flower craft that’s easy enough for kids to make? These paper flower crafts are great for Mother’s Day, classroom crafts, or a simple gift. Includes a free pattern! 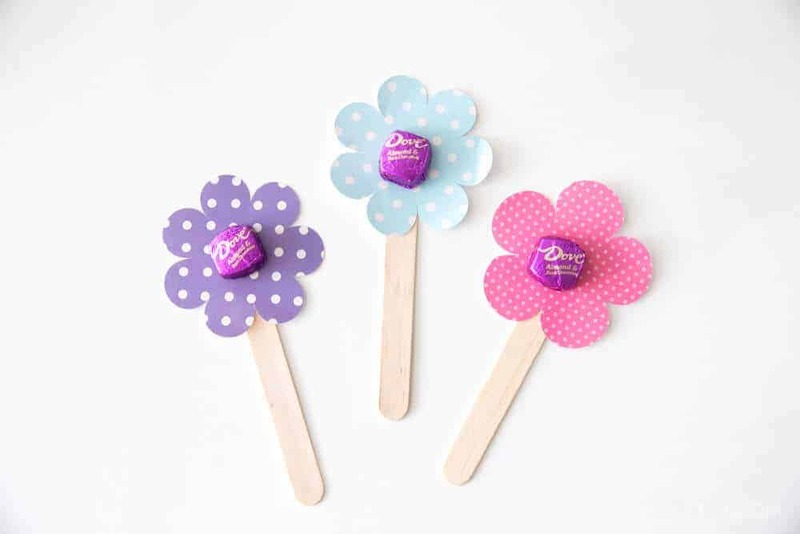 Brighten someone’s day with these cute and simple flowers! I was in charge of coming up with a Mother’s Day craft/gift for a group of 100 children. Mothers love flowers and mothers love chocolate, so we combined the two together! With just a little preparation on my part, the children were able to write love notes on the back and then put together the flowers as a gift for their moms. 1. Using a digital craft cutter or flower pattern, cut flower shapes out of patterned paper of your choice. I used my Silhouette craft cutter for this part since I needed to make about 100 flowers! If you don’t have a cutter, you could use this flower shaped paper punch or hand-cut the shapes using the pattern above. 2. Once you have the flowers cut, cut green leaves if you want that extra touch. Feel free to skip this step if you’d like. The flower crafts are cute with or without leaves. Tip: If you are going to write notes, make sure you write on the back of the flower before you attach it! 3. 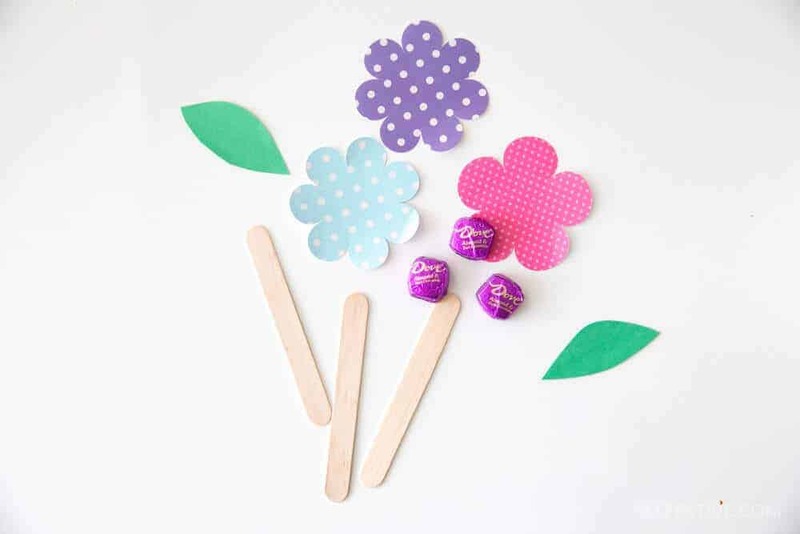 Using double-sided tape or glue, attach the flower to the thick popsicle stick. 4. 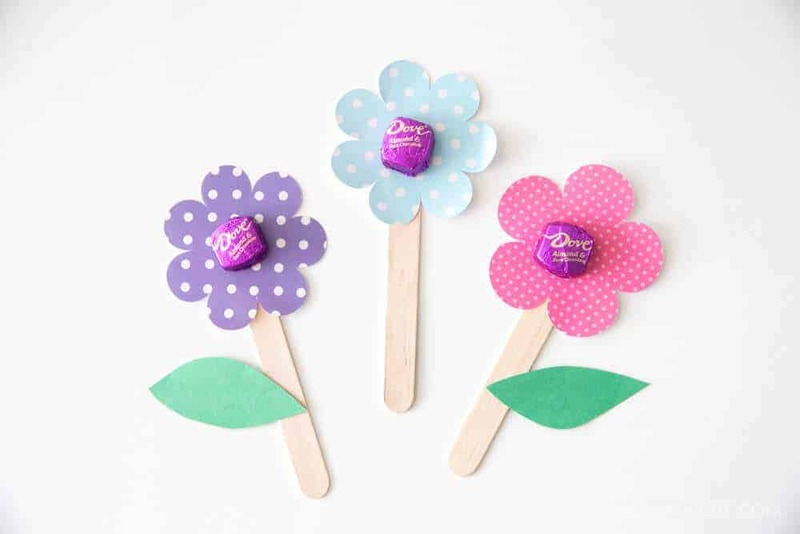 Use a glue-dot to attach the Dove chocolate to the center of your paper flower. And there you have it! An easy craft that will make others smile!